I created this activity from scratch. I put in over 20 hours to come up with survey questions, create the surveys, get ward members to answer the surveys, torture the data, find a template to use, and edit the template with all of our questions and answers. I thought more people would play it if the work was already done – so feel free to use some or all of what I have created. This game has ALL the bells and whistles! Sounds, visuals, music. It’s a blast! 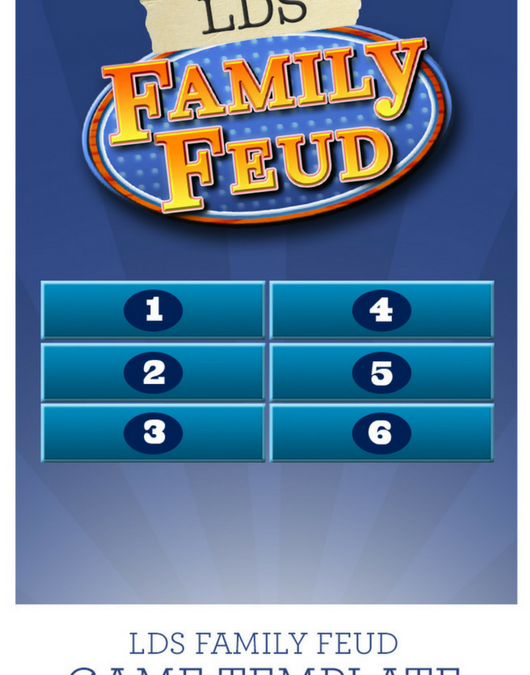 I found the original Family Feud game template at Youth Downloads. 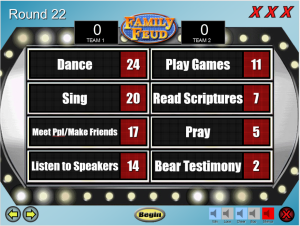 He gives the Family Feud game template away for free, but asks for a donation. So if you want to start from scratch. I recommend downloading his and making a donation directly to him. If you are interested in ours where the work is already done, this is where it’s at. We will give Youth Downloads $1 of every purchase we receive on our site. 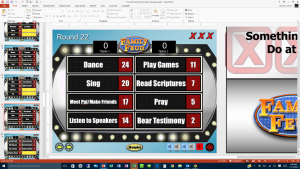 Once you download from either site, I HIGHLY recommend you got to Youth Downloads to see the instructions for editingthe Family Feud game template. If you are a regular MS PowerPoint user, it will be simple and you’ll be able to see what to do just by opening the document, but for those that might be intimidated by PowerPoint, Youth Downloads’ instructions are great. 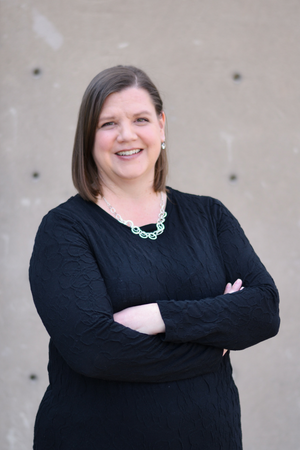 Questions I had all the YW presidency leaders come up with 10 questions each about 1 month before the activity so we’d have time to get responses. Surveys I used Survey Monkey to create the surveys. Their free plan is perfect for this activity. 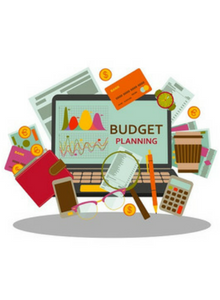 You can add 10 questions per survey and get 100 responses. Responses Our ward has a closed group on Facebook and so I posted links for each round asking for responses. I then went into each auxiliary one Sunday with handouts that had the links to the surveys for those that weren’t on Facebook. I heard that most families filled out the surveys as part of a Family Home Evening activity and had a blast. again, so I turned to my LDS friends on Facebook. I shared the links there and I was able to get the rest of the responses within a few days. A friend of mine emailed me excitedly letting me know she shared the surveys with some of her co-workers that are LDS (and bishops). I thanked her for doing that and helping me out. About two hours later she emailed me again apologizing for her co-workers’ answers. Data Torturing After I got the responses, I had to copy and paste all the responses into MS Excel, sort the information, then subtotal the responses. people are not, and so that is why I thought people might like this turn-key option. I originally had 45 questions, narrowed it down to 38, and then we only got through 29 before we ran out of time for the activity. I wanted to make sure the game worked and my idea to get over 70 youth through the game so everyone got a turn would work. So I set up a game night with about 15 adult couples in our ward for a fun date night at the church. We set up the projector, used game buzzers, and worked out the kinks. I asked each couple to bring a snack to share. We set the food table up behind the chairs. HUGE mistake. We had to keep calling the menfolk away from the snack table to play. Next time, we’ll just put the snack table in front of the five immediate male players. Overall, it was a great group date night! 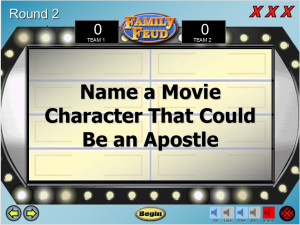 It's Time to Play the Family Feud! 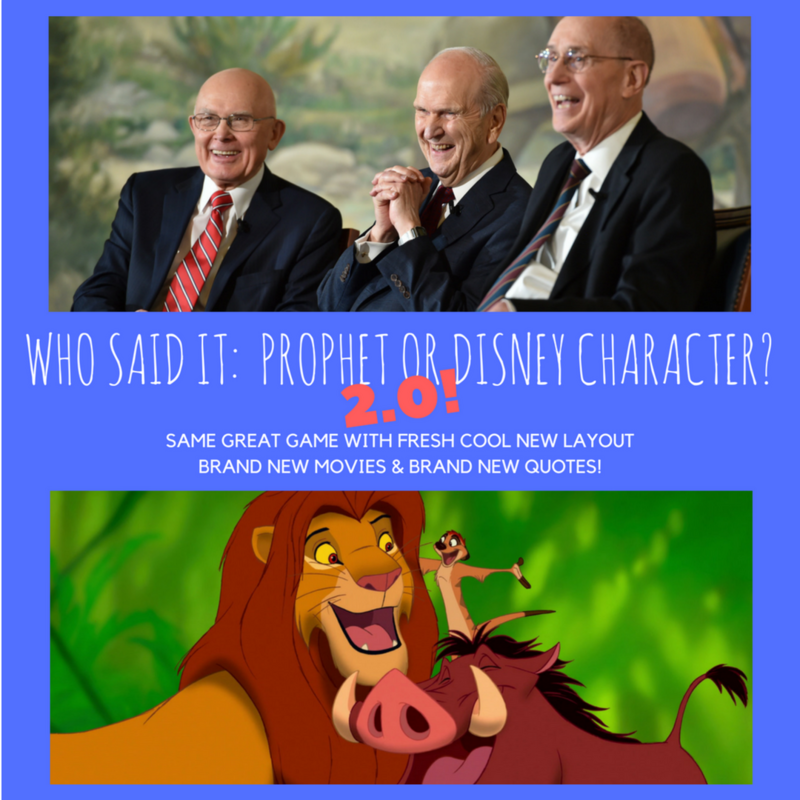 If you are looking for more fun LDS Youth Games, check out our Who Said It: Prophet or Disney Character or Who Said It: Prophet or Disney Character 2.0 games. ← Previous Post Who Said It: Prophet or Disney Character? 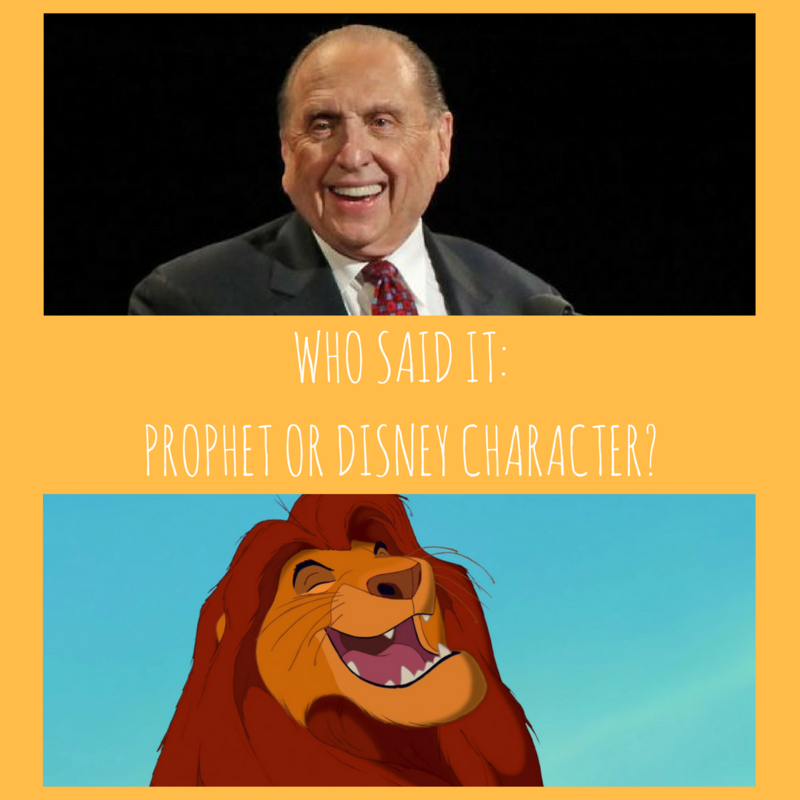 Next Post → Who Said It: Prophet or Disney Character? 2.0! We had over 70 youth in our ward when we played this game. We played YW vs YM. I had two columns of chairs with 5 chairs per row. Each row was a team. We had Beehives go against deacons, Mia Maids against Teachers, and Laurels against Priests. It wasn’t perfect, but close. We took one row on each side for a question, worked our way through the rows with lots of help from leaders. The kids did a pretty good job of following along, but some were just chatting and I was fine with that as long as they weren’t out of control. But that’s why I needed the leaders to really direct the kids while I ran the game and Emceed. The kids were fully engaged when it was their turn and a few questions before their turn. I hope that helps! Please let me know if you have any further questions. How did you remember/know the answers and numbers to the questions? I print the slides in black & white with 6 slides per page. This way I can see the answers and I mark them off. Having the slides let’s you know which number to click to show the answers. I purchased this and am practicing using it. However, I see that there is a scoreboard on the top of the template and have no idea on how to make the scoreboard keep score. Any suggestions? Thanks for purchasing the game! The score board is for aesthetics only. You will need to have someone be the score keeper. We use a whiteboard and have a volunteer keep track of the score. I would give this 5 out of 5 stars! This exceeded my expectations and it was so easy to use. We didn’t edit anything and used it just how it came. We used this for a YW/YM youth night for about 25 youth. It was so much fun and the sound effects were an added bonus! I would absolutely recommend this! Also Donna was extremely helpful when I had a question.